The Lord called David and Bong into the Gospel ministry after serving over thirty years in the United States Army. During David and Bong’s military service, the Lord provided opportunities to serve in His local church in several different locations in the United States and Germany. 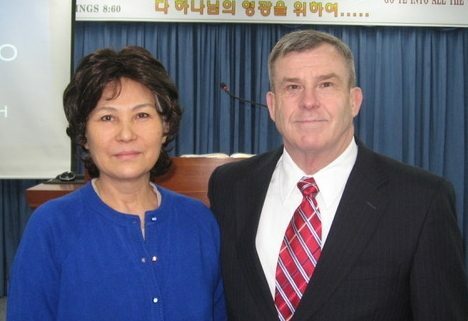 The Lord led David and Bong Russell to Armed Forces Baptist Missions in June 2003. Upon completion of deputation and preparation, David and Bong moved to South Korea in January 2006. The Lord blessed with a place to start a church very quickly and after much work and preparation, Armed Forces Baptist Church conducted its first service on Sunday morning, February 19, 2006 with ten adults and three children in attendance. Armed Forces Baptist Church is still carrying out the Great Commission. The Lord allowed David and Bong to start a second church, Grace Baptist Church, in Seongnam, South East Seoul, South Korea, near K16 Air Base. The first service was conducted Sunday morning, December 1, 2013, with nine adults and three children in attendance. Grace Baptist Church is still carrying out the Great Commission. More recently, God has led the Russells back to the United States to start Shalom Baptist Church in Radcliff, Kentucky. The church is located near both Army and National Guard military bases. Contact the Russells for more information and to sign up for prayer letters.